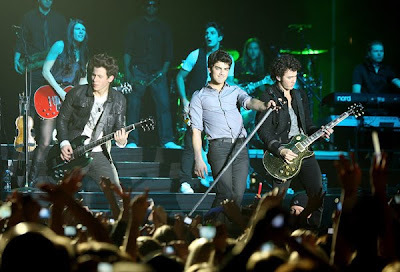 Home » » The Jonas Brothers. 2007 my obsession for those guys started. I remember exactly how I fell for them: I was watching Hannah Montana (I was only 10 back then, ok? :D) and they were featured in one episode. Since that day I am a Jonashead. A proud Jonashead. I still remember how nervous and happy I was when I saw them live in concert November 15th 2009 in Cologne. There were 3500 other Jonasfans and the athmosphere was just great. Those boys are the reason why I picked up a guitar and started to write music. I am so thankful that I got to know them. I even have my favorite lyrics ever engraved on my iPod. It's from "Take A Breath" - "people change and promises are broken".